Birds frolic at the Facility for Applied Avian Research (FAAR). 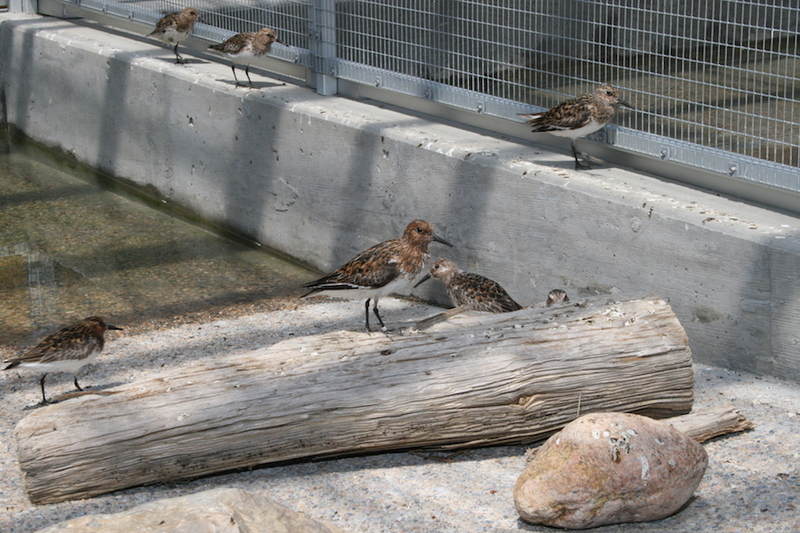 A group of small, rather unobtrusive birds, done up in plumage that tends to brown, white and grey, scurry around the water’s edge of the sloping concrete of their enclosure, hopping on an old piece of driftwood and a stone, oblivious to their human visitors. Researcher Christy Morrissey doing field work. “They’re pretty happy in here—they get lots to eat and there are no predators to bother them,” said Christy Morrissey of the sanderlings, a type of small shorebird, under her care. Morrissey is an ecotoxicologist with the Department of Biology and the School of Environment and Sustainability. Clad in lab coat and rubber boots, she is giving a tour of FAAR, the new Facility for Applied Avian Research tucked into an out-of-the-way corner of the horse paddocks behind the Western College of Veterinary Medicine. 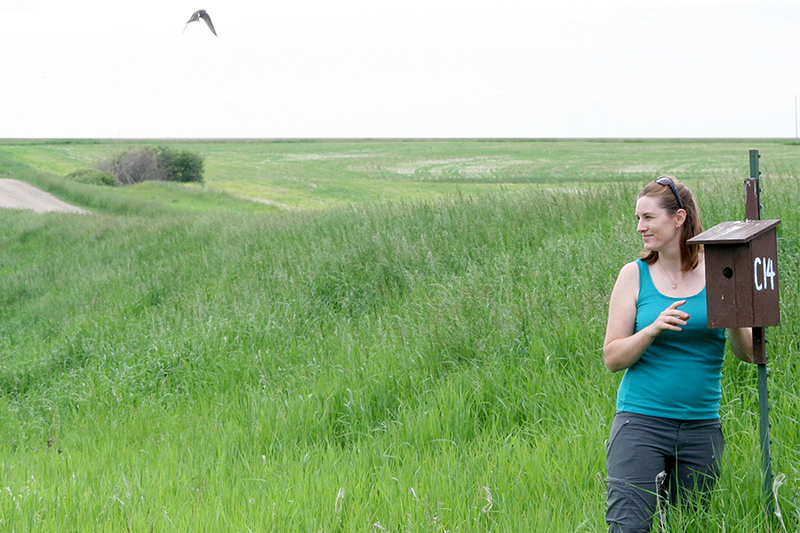 Devoted to ecotoxicology and avian health, FAAR is the only resource of its type in Western Canada. The $2.3 million facility opened in May, funded by $800,000 from the Canada Foundation for Innovation, matching funds from the Province of Saskatchewan, with the remainder from other partners and the U of S.
“Sanderling are a model species we’re using to understand the effects of marine pollutants,” she said, in this case, polycyclic aromatic hydrocarbons (PAHs) from petroleum – everything from catastrophic oil well leaks to tens of thousands of minor spills from things such as backyard oil changes. “This research on industrial pollutants actually gets me up in the morning and excites me,” Morrissey explains, although she concedes her work on agricultural pesticides, particularly neonicotinoid seed treatments (which remain a hot topic), tends to get more attention. “You Google my name and neonics are what I do,” she said. But Morrissey’s work on industrial pollutants may finally be “getting some love,” as she said, thanks to her latest success with the Natural Sciences and Engineering Research Council of Canada (NSERC). This spring, she secured more than $390,000 from three different NSERC grants to pursue her work on the effects of pollutants from industries such as petroleum, pulp and paper, and manufacturing. The focus of her work is migratory birds, which have been declining at an alarming rate. Some estimates show populations have been cut in half in the last 50 years, with profound implications. Sanderlings are a good example. The birds at FAAR were captured about 220 kilometres south of Saskatoon at Chaplin Lake, on the northern leg of their migratory journey. The birds spend their winters on southern coasts from the Gulf of Mexico well into South America and stop at Chaplin on their way to their Arctic breeding grounds. They are metabolic marvels, doubling their body weight before making the long flight north or south. They also grow more brain cells. “When birds migrate, they actually undergo a period of brain development, neurogenesis, that allows them to learn where they’re going,” said Morrissey, explaining birds use everything from stars and position of the sun to the Earth’s magnetic field and polarized light. Some of the work by Morrissey and her team shows that this interference with the bird’s ability to learn while its brain is developing causes something reminiscent of Fetal Alcohol Syndrome in humans. That is, it results in a permanent learning disability so the birds cannot migrate or migrate to the wrong place—both of which are bad and are presumed to have lethal outcomes in the wild. Morrissey suspects the chemicals may also be interfering with the birds’ metabolism, so no matter how much they eat, their bodies don’t produce or store enough fat. This phenomenon is well-documented in rats, and she is in the process of seeing if it is also true for birds. “To successfully migrate you’ve got to be able to put on that fat efficiently and there’s some research that shows birds are taking longer – some of these shorebird species – to put on fat,” she said. So why care about birds? Morrissey explains birds offer more than their intrinsic value as living things. Most obvious is aesthetic: they often look and sound pleasing to people, driving a multimillion-dollar bird lovers industry that creates markets for everything from bird seed to binoculars to guided tours. “Birds definitely have a lot of aesthetic and recreational value,” Morrissey said, but she emphasizes their ecosystem services are of inestimable value that humans ignore at their peril. For example, birds are important controls to the most deadly (to humans) animal on Earth: the mosquito. While more of a summer annoyance in Canada, the bugs transmit a host of diseases, from malaria and dengue fever to West Nile and Zika viruses. Birds also protect the food supply. Morrissey cites an example from 1950s China where, during Mao’s Great Leap Forward, common sparrows were declared one of the “Four Pests” (along with mosquitoes, flies and rats). Only then did the Chinese discover that while the sparrows had been eating a bit of grain, they had been eating far more insect crop pests. The result was a famine that starved 30 million people. Another example was India and Pakistan, whose vultures began to mysteriously die in catastrophic numbers in the 1990s. By the time the cause was found—the veterinary drug diclofenac, highly toxic to the birds—more than 95 per cent of some species had died in 10 years. Without vultures to clean up dead cows, rats and wild dog populations exploded, spreading disease. While the drug was banned more than 10 years ago, it will be years before vulture populations rebound. Morrissey stresses she is not anti-pesticide or anti-chemical, but that these tools can be dangerous so should be used cautiously. “When it comes to chemical use, I don’t think we are thinking carefully enough about the big picture and the impact these chemicals can have on birds and ultimately humans,” she said, explaining her role is to create knowledge to help do this. Morrissey and her work are featured in the award-winning documentary The Messenger, coming to the Neatby-Timlin theatre at the U of S September 29 as part of a cross-Canada tour. The 7:00 p.m. showing will be followed by a question and answer session.